Human nature band also known as the 4 Trax is the top selling pop vocal group and also boasts as Las Vegas headliners. The music group that blends retro cool with sounds of a contemporary nature will bring the ultimate jukebox party to Las Vegas. Their marvelous playlist will offer listeners and revelers a taste of the group’s musical influences and all-time hits while mixing Pop classics, Soul standards, Motown and many others. Audiences will be taken through a great journey down the memory lane of the various music genres. The group will deliver great hits while paying tribute to Soul and Motown legends while at the same time giving its fans a taste of the Doo-Wop era classics to the climax of their latest sensations. Human Nature group performs a few songs acappella style relying only on their gorgeous voices making sure to nail each and every note. 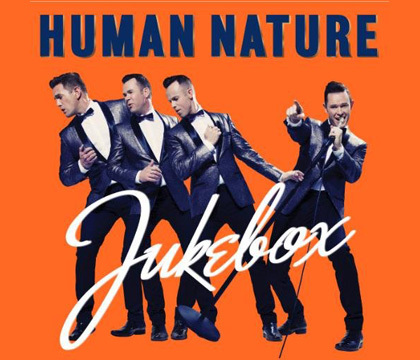 Human Nature was formed in 1989 in Australia by Toby Allen, Phil Burton, Michael Tierney and Andrew Tierney. The group started as a doo-wop group called the 4 Trax. They signed with Sony Music and released their first album in 1996 called “Telling Everybody”. Three of their albums afterwards received multi-platinum certification from ARIA. By April 2011 four of Human Nature’s albums had received platinum with a sales record of over 1.6 million records. They also received an award as the Highest Selling Album for Reach Out: The Motown Record. They began residency performance in May 2009 by a Motown-themed show on the Last Vegas Strip. By 2014 they had completed their 1000th residency show.Human Nature asked to cover one of Smokey Robinson’s classic songs and that is how they first met. He was impressed by their audition and allowed them to use his song. He went further to bring them to the states and made them the first Australian group to have their own residency show on The Strip. Human Nature music group has gone for both national and international tours. They have toured as Celine Dion’s support act in March 1996 and June 1997 and in 1998. They also got the honors of curtain raising for Michael Jackson on the History World Tour of December 1996 to 1997. There are various things worth looking forward to as you buy your tickets for the show and these performers will not disappoint you. You are guaranteed to get the full value of your money. The four members of Human Nature will treat their audience to an energetic and highly entertaining performance. The four members will give their fans a show full of charisma, fantastic harmonies and energetic dancing as always. Apart from their classics their new songs will drive the crowd crazy as they work to inject light humour somewhere in between the show. The group has harmonized lyrics no wonder Jukebox at the Venetian has become a Vegas sensation bringing fans back to the historic ages of melodic vocals ruling the airwaves. Human Nature boasts of being the number one Boy Bank in Australia, thanks to its energetic and dynamic members. The Vegas audience will get the chance to be treated to a complicated choreography blended with jukebox singing. It will be an amazing show for all ages from the youngsters to elderly who can only participate to the performance by toe tapping. The group will get the audience on their feet to teach them a few dance moves that are simple to create a joyous experience as the showroom dances to the same rhythm in synch. Be sure to listen to their own rendition of Bruno Mars and Justin Timberlake songs. The old classics will augur well with the elderly. Human Nature offers visually stunning show, one with great stage direction and set created by the bands creative director and blending costumes to the classic cutting edge. Human Nature fans will be treated to a classic show in Vegas where apart from seeing their favorite pop group they will also get an opportunity to contribute to the shows playlist by choosing their favorite song to be performed by the group. The hits will rock you in your sit. They will range from “Uptown Funk” to “Under the Boardwalk”. Get ready to stomp your feet, snap your fingers and clap your hands and even better learn new dance moves. Human Nature Show in Vegas will offer you an opportunity to meet your favorite Australian pop group artists. The entire band will be present and at your disposal. You will talk to them and participate in their performances singing to their tunes as much as you like. It will be great fun. You will get to listen to great music hits from this band ranging from wishes, don’t say, Goodbye, Every time You cry, Don’t cry, Eternal Flame, He don’t love you, When you say you love me, Telling Everybody, Counting Down, Reach out, Get Ready and many others. After the show the four members of Human Nature will get to socialize and interact with their fans on a one on one basis taking photos and signing autographs. For those who have autographs and need them to get signed this will be your chance to see those clothes, caps, albums and books signed for you after a night of entertainment from your favorite pop group.They take their time and enjoy friendly conversations with their esteemed fans and even answering questions. With each passing day, the impact of music in today's society continues to grow, and there are no signs of stopping this trend. In addition, Vegas has become the center of pop culture and Human Nature could not pass up the opportunity to be a part of it. It will be no surprise at all to see the Human Nature Group blowing away audiences with their amazing renditions of classic Pop, Motown, Soul and doo-wop hits since the group first opened their residency show in Las Vegas having even impressed Smokey Robinson himself thus earning them the gig. This coming show will be held at the Venetian in Las Vegas.